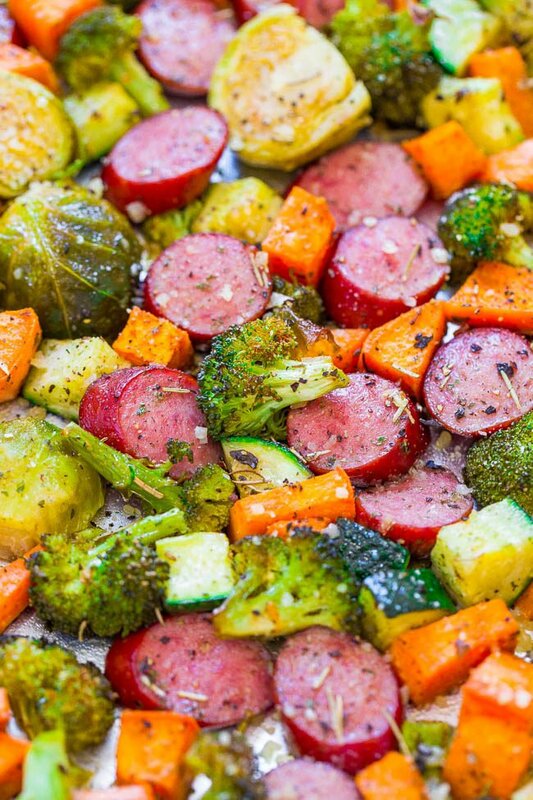 Sheet Pan Turkey Sausage and Vegetables – An EASY, one-pan recipe the whole family will love!! Seasoned crisp-tender veggies, juicy sausage, and Parmesan cheese for the DELISH dinnertime WIN!! If you’re like me there are many nights that figuring out what to make for dinner seems like a daunting mystery. I’m always thinking to myself that I want to make something new, something the whole family will enjoy, something that’s easy and affordable while still being healthy yet tasty. With this easy sheet pan dinner that’s ready in under an hour the what-to-make mystery is solved. It checks all of the boxes above. 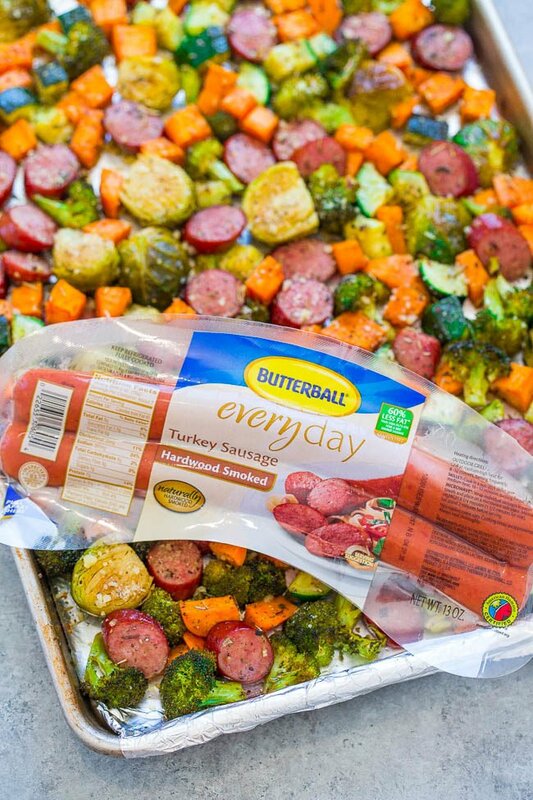 The recipes takes advantage of lean, protein-packed Butterball Everyday Smoked Turkey Dinner Sausage. The sausage is already cooked and getting this meal on the table is as easy as slicing the sausage, chopping the vegetables, and throwing it all on a sheet pan. Line your pan with foil so that cleanup is a breeze. My family loves turkey and Butterball calls people like us Turketarians – people who believe that if you aren’t eating turkey, you’re missing out. Turkey is part of a healthy lifestyle so don’t save your turkey eating for just the holidays when you can have it year round. I used vegetables that are fall-inspired like sweet potatoes and Brussels sprouts along with zucchini and broccoli, but you can also use bell peppers, cherry tomatoes, green beans, or whatever you have in your produce drawer or that your family loves. The veggies develop great flavor because they’re not only seasoned with onion flakes, oregano, parsley, and rosemary but because the sausage is smoked, it lightly perfumes the veggies with a mild smoky flavor. One important tip is to dice your sweet potatoes quite small, no more than 1/2-inch in size, so they cook through in the time it takes the rest of the vegetables to cook through. The same goes for the Brussels sprouts – if you have extra large ones, I would quarter them rather than just halving them. A sprinkle with Parmesan cheese adds a finishing touch for a savory, salty pop. I have a helpful video to show you just how to make this easy recipe. Put this on your easy weeknight dinner rotation. Your Turketarian friends and family will love how good it tastes. With this easy sheet pan dinner that’s ready in under an hour the what-to-make mystery is solved. It’s something the whole family will enjoy, it’s easy and affordable while still being healthy yet tasty. The sausage is already cooked and getting this meal on the table is as easy as slicing the sausage, chopping the vegetables, and throwing it all on a sheet pan. Line your pan with foil so that cleanup is a breeze. Dice your sweet potatoes quite small, no more than 1/2-inch in size, so they cook through in time and quarter rather than halve large Brussels sprouts. Preheat oven to 400F. 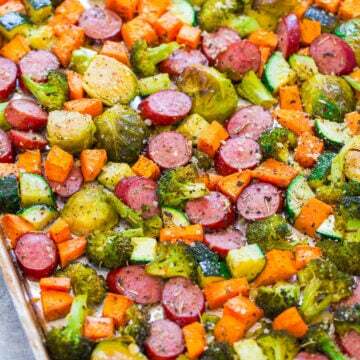 Line a baking sheet with aluminum foil for easier cleanup, and add the sausage, Brussels sprouts, sweet potato, zucchini, broccoli, and evenly drizzle with olive oil. Evenly sprinkle with the onion flakes, parsley, oregano, rosemary, salt, pepper, and toss with your hands to evenly coat and distribute seasonings. 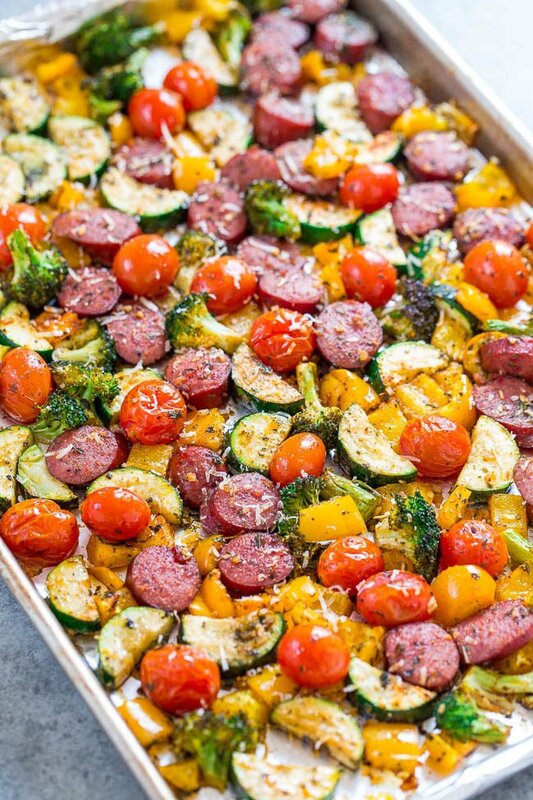 Scatter vegetables in a flat layer and not piled on top of each other; it’s okay if your baking sheet is very crowded because the vegetables do shrink as they cook. Bake for about 45 to 60 minutes, or until vegetables are tender and have as much color as desired; toss halfway through baking to ensure even cooking. Start checking at 40 minutes for doneness since all ovens, veggies, etc. vary. 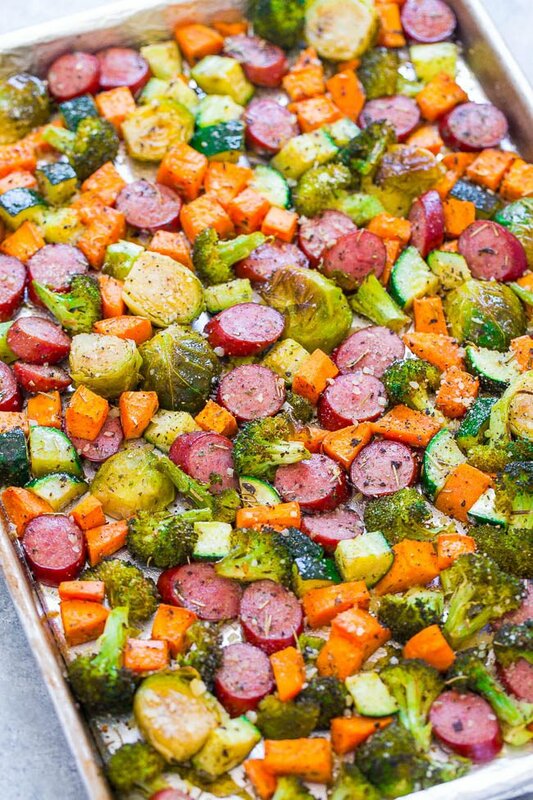 Sheet Pan Sausage and Vegetables – Fast, easy, one pan recipe that’s full of flavor! Juicy sausage, lots of veggies, and a dusting of Parmesan cheese to finish it off! Put it into your regular rotation! 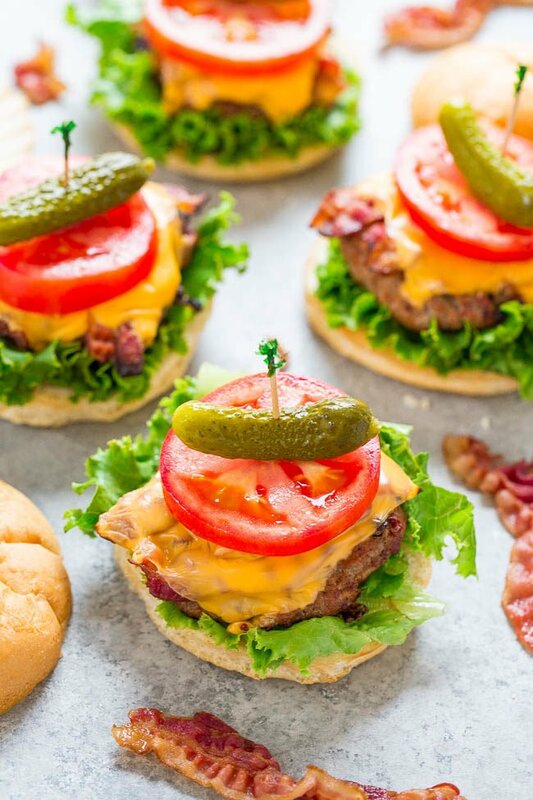 Grilled BLT Turkey Burgers – Juicy burgers topped with cheese, bacon, lettuce, and tomato! Easy, ready in 15 minutes, and perfect for summer parties!! Healthier than beef and irresistible! 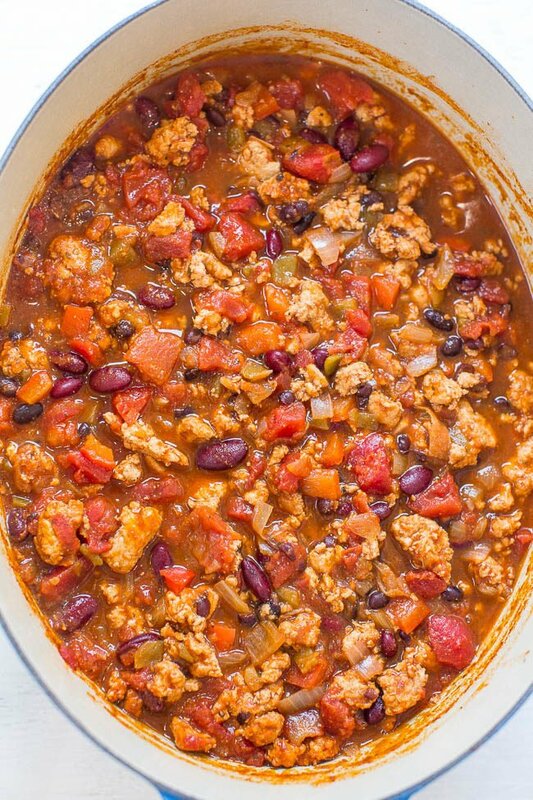 Easy 30-Minute Turkey Chili – Don’t have all day for chili to simmer? No problem! This easy hearty, healthy chili is ready in 30 minutes and it’s full of flavor! Perfect for busy weeknights! 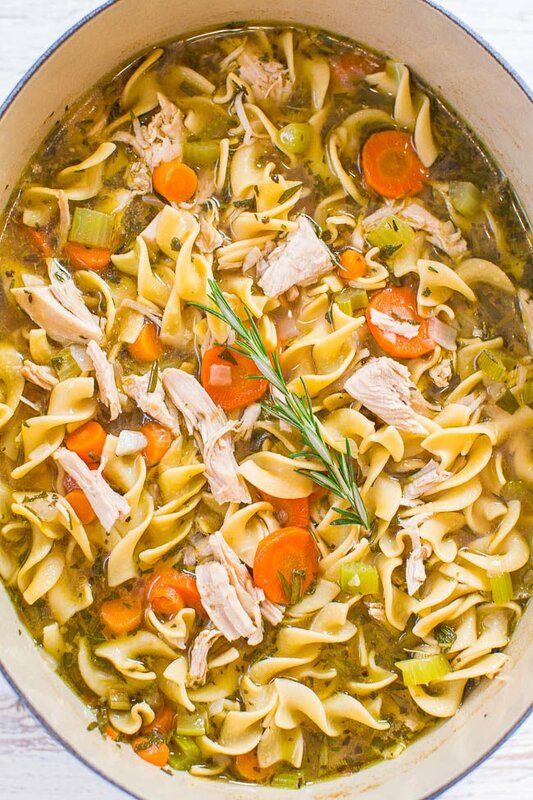 Easy 30-Minute Turkey Noodle Soup – Have leftover holiday turkey? Make this! It’s fast, easy, hearty, loaded with flavor, and tastes like grandma’s homemade chicken noodle soup, but with turkey! 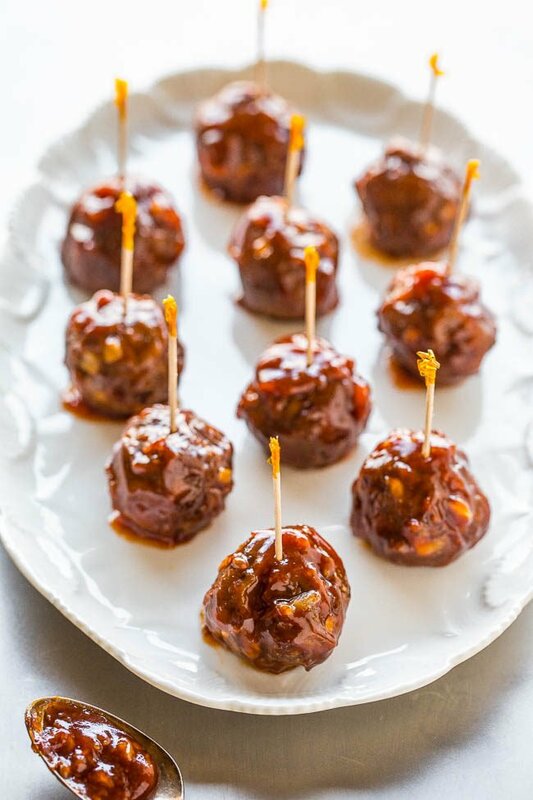 Make sure to visit Butterball.com and on their social media for special savings, recipe ideas, and giveaways. Post is brought to you by Butterball. The recipe, images, video, text, and opinions expressed are my own. I need to try this! I made many of your sheet pan recipes last year and loved how easy they are. The leftovers are a big plus as well. We’ve had a mild summer so I son’t mind turning the oven on, but this recipe also reminds me that autumn is coming! It’s that time of year when sheet pan dinners seem to be appropriate and will be making their comeback. Our summer has been mild too; the past few years at this point in the summer it was in the 90s for weeks on end! I’m ahead of you! I always buy the turkey sausage and I made your previous sausage sheet pan recipe with it. My family loves it … but unlike Paula, we never have leftovers. Too many people fighting to eat it up. :) I need to try your chicken version of the meal next. I just made my first sheet pan meal last week and am kicking myself for not doing it sooner. Totally trying this sausage, we love turkey everything. They’re lifesavers! Especially when you can just add everything at once, stick it in the oven, and forget about it til dinner is ready! Yes, yes one hundred times yes. This looks AMAZING, and I LOVE how easy it is! Totally saving this one. Love the new site Averie! How about all the grease that comes out from the sausage? Should I boil the sliced sausages first before putting on baking sheet? I am going to use regular smoke sausage (husband’s relative had a turkey farm, I tend to not eat turkey anymore). There is very little grease that comes out from the Butterball Turkey Sausage that I used. Make the recipe exactly as written and as shown in the video. This was so tasty! I had three helpings when I took it out of the oven. If I hadn’t got my tummy full; I’d still be eating! Thanks for the recipe. It’s a keeper! This was fabulous. Packed with flavor and healthy goodness and sooooo easy to make during the week. Definitely will be making this a staple in my household!!!! Thanks for trying the recipe and I’m glad it came out great for you! Glad it’s going to be a staple!